With the Pyeongchang, South Korea Olympic Games taking place this month, it is interesting to reflect on some of the big events of the 2010 Olympic Games in Vancouver; when it was in our backyard. In the Men’s Downhill race at Whistler, for example, the winning time of 1:54:31 was posted by Didier Défago of Switzerland. The time among medalists was the closest in Olympic history. While Mario Scheiber of Austria posted a time of 1:54:52 – just two tenths of a second slower than Défago – he finished out of the medals in fourth place. Protect your gross margin. Oftentimes, when leading up to being listed for sale, companies grow by chasing low-margin business. You tell yourself you need top-line growth, but when an acquirer sees your growth has come at the expense of your gross margin, she will question your pricing authority and assume your journey to the bottom of the commoditization heap has begun. Secure your contracts. If you have formal contracts with your customers, make sure they include a “survivor clause” stipulating that the obligations of the contract “survive” the change of ownership of your company. That way, your customers can’t use the sale of your company to wiggle out of their commitments to your business. Have a lawyer prepare the language to ensure it is valid in your jurisdiction. To grow a valuable business – one you can sell – you need to set up your company so that it is no longer reliant on you. To scale up a knowledge-based business, you first have to figure out how to impart your knowledge to your employees. However, it can be difficult to condense years of school and on-the-job learning into a few weeks of employee training. The more specialized your knowledge, the harder it is. A dentist trains for years to acquire the education and experience to successfully complete a root canal, but it’s relatively easy to train a hygienist to perform a regularly scheduled cleaning. It’s almost effortless for a real estate manager to hire someone to clean the eavestrough once a month, but repairing the flooded basement caused by the clogged gutters can be quite complex. 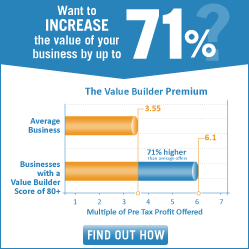 A recent survey by The Value Builder Score found companies that would perform well without their owner being present for a period of three months are 50 percent more likely to get an offer to be acquired when compared to more owner-dependent businesses. The better your company is able to run without you, the more valuable it will be when you’re ready to sell. A good method for determining your company’s ability to handle your absence is to simply take a vacation. There is no better justification for a blissful, uninterrupted holiday than assessing how your company performs in your absence. When you take your vacation, leave your computer at home and switch off your mobile. When you return, you’ll probably discover that your employees were resourceful and found answers to many questions they would have asked you if you had been just down the hall. That’s a good thing, and a sign you can confidently start planning an even longer vacation. You’ll also likely come back to an inbox full of issues that need your personal attention. Instead of immediately finding solutions for each problem in a frenzied attempt to clean up your inbox, use this as an opportunity. Slow down and look at each issue with the goal of identifying problems with your people, systems or authorizations. Then, ask yourself a few simple questions about each one of those three categories. Answering those same questions will help you build a plan to make your business more attractive to potential buyers. Start with questions about your people.Why did this problem end up on your desk, and not someone else’s desk? Who else is qualified to answer this question and why was that person not consulted? If nobody else is qualified, who can be trained to answer this question in the future? Next, look at your systems and procedures. Could the issue have been dealt with if you had a system or a set of rules in place? The best systems are hardwired and do not require human interpretation. If you’re not able to lock down a technical fix, then at least provide employees a set of rules to follow in the future. You may be a bottleneck in your own company if you’re trying to control spending too much. Employees may know what to do but lack the means of paying for the fix they know you would want. You might provide an employee with a pre-approved monthly spending limit for a specific supplier. Or you might give an employee an annual budget for discretionary spending: money they can spend without seeking your approval. Taking a holiday often seems to be more of a hassle than it’s worth, given the fires that may need to be extinguished when you return. But if you transform the aftermath of a vacation into systems and training that allow employees to act on their own, you’ll find the vacation is worth what you paid for it many times over: your company will increase in value as it becomes less dependent on you. If you have resolved to make your company more valuable in 2018, you may want to think hard about how your customers pay. If you have a transaction business model, a model in which customers pay once for what they buy, expect your company’s value to be a single-digit multiple of your Earnings Before Interest Taxes, Depreciation and Amortization (EBITDA). By contrast, if you have a recurring revenue model, a model in which customers subscribe and pay on an ongoing basis, you can expect your valuation to be a multiple of your revenue. In 1992 Stephanie Breedlove started a payroll company to make it easier for parents to pay their nannies on a recurring basis. It began small, with Breedlove self-funding the company’s growth, which averaged 20% per year. By 2012, Breedlove & Associates reached $9 million in annual sales. That same year Breedlove accepted a $55 million offer from Care.com for her business,an astronomical multiple of more than six times Breedlove’s revenue. Buyers will pay more for companies with opportunities for recurring revenue because they can clearly see how your company will make money long after you leave the business. If you have a product that people run out of, consider offering it on subscription. The retailing giant Target sells subscriptions to diapers for busy parents who don’t have the time for (or interest in) running to the store to re-stock on Pampers. Dollar Shave Club, which was recently acquired by Unilever for five times its revenue, sells razor blades on subscription. The Honest Company sells dish detergent and safe household cleaning products to environmentally conscious consumers: more than 80% of their sales come from subscriptions. If you’re a consultant and offer specialized advice, consider whether customers might pay to access a premium membership website where you offer your know-how to subscribers only. Today there are membership websites for people to learn about everything from search engine marketing to running a restaurant. Ask yourself what your “one-off” customers buy after they purchase your product. . For example, if you build a y a new website for a companythey are probably going to need somewhere to host their site. While your initial website design may be a one-off service, you could offer to host it for your customer on subscription. If you offer interior design, chances are your customers are going to want to keep their home looking like the day you presented your design, so they might be in the market for a regular cleaning service. If you offer something expensive that customers only need occasionally, consider renting access to it for those who subscribe. ZipCar subscribers can have access to a car when they need it without forking over the cash to buy a hunk of steel. WeWork subscribers can have access to the company’s shared work spaces without buying a building or committing to a long-term lease. The majority of businesses operating in North America today started out as service companies. If you want to start a web design firm, you don’t need a lot of money; just some technical know-how. Enterprising professionals who know how to get the media’s attention can start their own public relations firms without much more capital required than a smartphone. But if you want to build a valuable company that you can eventually sell, you’ll want to stop presenting yourself as a service firm. Consultancies are not usually valuable businesses, because acquirers generally view them as a collection of people who spend their time spinning on a hamster wheel. The typical way to sell a consultancy is for the consultants themselves to trade their equity for a job, in the form of an earn-out that may or may not have an upside. Defining your company as a ‘consultancy’ announces to the market you are a collection of people who have banded together around an area of expertise. Consultancies rarely get acquired, and when they do, it is usually with an earn-out. Replace ‘consultancy’ with ‘business’ or ‘company’. An engagement happens before two people get married; using the word in a business context reinforces the people-dependent nature of your company. Replace the word ‘engagement’ with ‘contract’, and you’ll sound a lot more like a business with some lasting value. A deck is a place to have a glass of wine or beer. It’s not a word to use to describe a PowerPoint presentation unless you want to look like a ‘consultancy’. Instead of describing yourself using the vague term ‘consultant’, describe what you consult on. If you are a search engine optimization consultant who has developed a methodology for improving a website’s natural search performance, then say that: you ‘run an SEO company’ or you ‘help companies improve their ranking on search engines like Google’. Consultants promise ‘deliverables’. Valuable businesses guarantee the features and benefits of their product or service. If you refer to your employees with the telltale labels of a consultancy, consider replacing ‘associate’, ‘engagement manager’ and ‘partner’ with titles like ‘manager’,” ‘director’ and ‘vice-president’ and you’ll reduce the chance of your customers expecting a bill calculated at 10-minute increments. The word ‘client’ implies a sense of hierarchy in which service providers serve at the pleasure of their client. Companies with ‘clients’ are usually prepared to do just about anything to serve their clients’ need. This sounds great to clients, but also conveys a message to outsiders that you customize your work to a point where you have no leverage or scalability in your business model. Would your ‘clients’ really care if you started referring to them as ‘customers’? It’s easy to get stuck in a low-growth consulting company. ‘Clients’ expect to deal with a ‘partner’ on their ‘engagements’, so the business stalls when the partners run out of time to sell. If a company ever decides it wants to buy your consultancy, acquirers will know they have to tie up the partners on an earn-out to transfer any of the value. When it comes to the value of your business, optics matter and the first step in avoiding the consulting company valuation discount is to stop using the lingo. In any negotiation, being the person who makes the first move usually puts you at a slight disadvantage. First-movers tip their hand, revealing just how much he or she wants the asset being negotiated. Likewise, when considering the sale of your business, it is always nice to be courted rather than being the one doing the courting. The good news is that the chances of getting an unsolicited offer from someone wanting to buy your business are actually increasing. 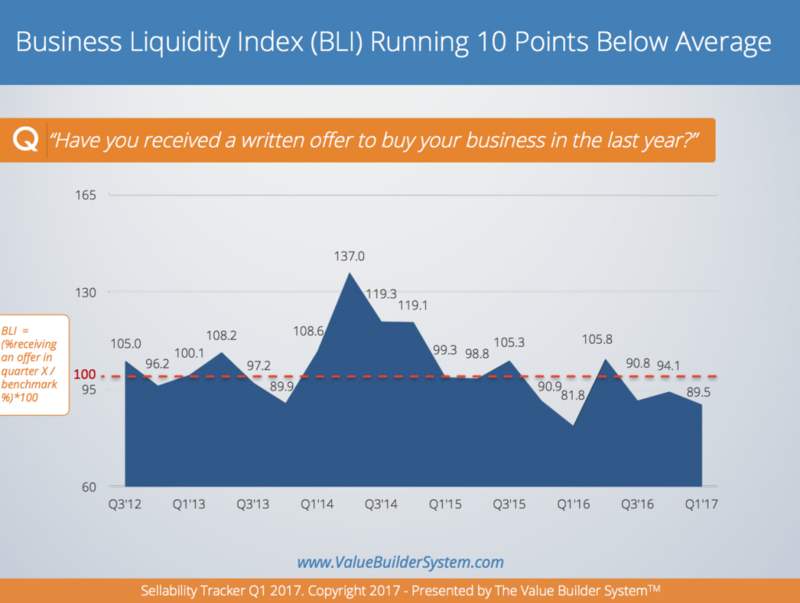 According to the Q1, 2017 Sellability Tracker analysis, you’re about 10% more likely to get an offer to buy your business today than you were in 2016. Big companies are buying little ones for a lot of reasons, and the current market conditions are accelerating their appetite. When interest rates are low and stock markets are high, acquirers have the ideal platform to realize a return on their investment from buying a business like yours. Engaging a public relations professional to tell your story to the media can put you on the radar of buyers in your industry. A lot of public relations professionals focus on the big mainstream publications, and these are important, but you must also ensure that your PR firm also targets trade publications and industry-specific websites read by acquirers in your industry. Hosting an event such as a conference, trade show or summit for your industry is a good way to get acquirers to notice you as an industry leader. Personally invite representatives from potential acquiring businesses to attend: they will find his very flattering and initiates a personal relationship. Serve on a board of directors with an executive from a company you think would make a natural buyer for your business. This is a great way to get noticed by an acquirer without having to announce your business is for sale. Inviting a senior executive from a potential acquirer to join you for a meal under the guise of discussing trends in your industry is also a great way to get noticed. Your lunch mate may realize that your company could play a key role in helping them grow. If not, you might still glean some useful information about how big companies are seeing the evolution of your industry. Have you ever noticed that firefighters always back the fire trucks into the fire-hall? Do you wonder why they don’t just pull into their parking spot hood-forward like the rest of us? It is because backing into the hall at the end of a shift saves them time when they have to respond to a call. They back in so that they are ready; whether the call comes in 5 minutes or 5 days, they must be prepared to get those trucks out of the hall and on the road as quickly as possible. As a business owner, you are like a firefighter: you always need to be prepared. Consider the graphic below from Sellability Tracker. The proportion of business owners receiving offer to buy their company fluctuates over time but is up from Q1 2016. The proportion of business owners getting an offer from a potential buyer is an important statistic because it measures one half of the equation of a business sale. For a transaction to take place, there must be both a willing seller and a willing buyer. Neither of these circumstances can be predicted, but you need to be prepared. Companies become more acquisitive when they have access to more cash than required for day-to-day operations. That was the case following the liquidity crisis of 2008; interest rates were incredibly low, and companies cautiously maintained profits on their balance sheets for a rainy day. In years when companies don’t have a lot of excess cash to acquire other businesses, attracting potential buyers means businesses have to offering high value in return for the cost of the investment. No matter which scenario you face, being prepared means having a sellable asset when opportunity strikes. You always need to operate your business as if a potential sale is just around the corner. Companies that are disorganized, have shoddy bookkeeping, too much customer concentration or are run by a hub & spoke manager will end up being passed over in favor of turnkey operations. It’s a compelling offer and it’s the reason why, according to TIME Magazine, more than 10 million people have signed up. If you do the math, you’ll see that makes Prime an almost billion-dollar business for Amazon. And like most programs, members pay up front, giving Amazon a big injection of cash on an annual basis. But what is even more interesting is the effect of being a member of Prime on the buying behavior of the average Amazon customer. Prime customers pay their $79 up front and therefore are eager to ‘get their money back’ by purchasing a bigger and broader array of products from Amazon. With free shipping and a $79 investment to recover, Prime customers go well beyond buying books from Amazon and now get everything from tires to turtlenecks from the e-tailer. According to TIME, the average Prime customer now spends $1,224 per year with Amazon vs. the average non-Prime customer who spends just $505. In other words, Prime customers spend almost three times more per year than non-members. Most businesses have some sort of loyalty program (Buy nine sandwiches and the tenth is on us! or Get five haircuts and the sixth is free!). The difference with Amazon Prime is they are charging customers to sign up for their special club and that changes their buying behavior: they want to recover their membership fee. Amazon did not invent the pay-to-join-our-club business model. Private members clubs have been doing it for years. Joining an elite golf club requires an initiation fee of tens of thousands of dollars, which then acts as a barrier to ever leaving. But as with Amazon Prime customers, becoming a member also changes a member’s buying behavior regarding other items. When compared to someone playing 18 holes of golf at a public course, the average golf club member is much more likely to buy balls from the shop, lessons from the pro, and dinner from the dining room. The “AMC Stubs” loyalty program offered by AMC Theatres charges moviegoers to join their club. In return, customers get free size upgrades on popcorn and drink orders, and $10 worth of Stubs rewards to spend on anything in the theatre for every $100 spent. AMC’s best customers become even better customers by going to the movies more frequently, and filling up with goodies while they’re there. Look at the spending patterns of people who pay a premium to join a credit card company’s loyalty program: customers who pay upfront for a premium card charge more goods and services to their card than people using a freebie card. Getting your customers to pay to join your elite customer club will require you to design an offer as compelling as the offers made by Amazon Prime and AMC Stubs. But if you build it right, the club itself will turn a profit, provide a quick boost to your cash flow and create a legion of sticky customers who spend more because they paid to become a member. On June 1, 2011, both locations of Floyd’s Coffee Shop in Portland, Oregon were busier than usual. The regulars were elbowed out of the way by new customers visiting the store for the first time to redeem their coupons and purchase $10 worth of coffee for $3. This tempting offer was made because Floyd’s had been picked as the first-ever Google Offers “deal.” Google Offers is the company’s baby step into the world of “social buying”-style promotions: special, limited-time offers made by businesses hoping that a deal will spread virally and introduce a legion of new customers to their business. Google, of course, did not invent the deal-of-the-day category. They were goaded into it after their generous $6 billion dollar offer to buy Groupon was turned down. Now Groupon is starting to feel the pinch after thumbing their nose at one of the world’s most valuable companies. According to compete.com, Groupon’s traffic went from 33.7 million unique visitors in June of 2011 to just 18.3 million unique visitors in January of 2012. That’s a drop of almost half inside less than a year. Not surprisingly, Groupon’s stock is also down by about 25% since its IPO last year. What is the moral of the story? Be careful not to overplay your hand when being approached by someone who wants to buy your company. Businesses looking to acquire other businesses usually have deep pockets, and while you may think your business is unique, never underestimate the resolve of a big company with lots of cash. They do have an alternative to buying you: competing with you. Typically, when buyers make the decision to walk away from the negotiation table they do not leave empty-handed. They come away with new-found insight on how you run your business–what works and what flops–so they have an enormous head start to launch a competitive company. And it doesn’t just happen in Silicon Valley. Take a hypothetical example of a home security company generating $500,000 per year in profit (before tax) installing and monitoring home alarms. One day a big alarm company comes along and says they want to buy the business and they’re willing to pay four times the pre-tax profit. The alarm company owner turns up his nose and demands six times the pre-tax profit. Now the suitor has a choice. They can try and negotiate with the owner, but that would undermine the economics of the model they’ve used to buy hundreds of similar alarm companies across the country. Or, they can simply hire someone to start an office to compete with the smaller company. Let’s say they pick the second option and hire a young, aggressive manager. They guarantee her $200,000 a year in the first 12 months on the job while she is building her business. The small alarm company has not only lost the opportunity to sell their business; they’re now competing against a young, motivated rival with a parent company that has an extra $1,800,000 ($2,000,000 withdrawn offer minus the $200,000/ year salary for their manager) that they didn’t use to buy the smaller company and they’re putting it towards helping this new competitor build her business. If you’re lucky enough to be approached by a big company who wants to buy yours, remember that they are usually not choosing between buying you or buying your competitor. They are often choosing between buying you or setting up shop to compete with you.